When I was a child, a very long time ago, the Feast of the Assumption was a rather mystical and bewildering day. It was full of pious rituals and stylised images of what appeared to be statues of the Virgin Mary hovering rather precariously over the world. As a child none of this made much sense as I could not find a point of personal connection and despite probing and praying I could not move past that passive, perfect plaster-like figure of Mary until I understood that as just a “construct – it was a construct based on a male narrative of female perfection and represented a very under-developed theology (mine and those who continued to find order and purpose in the depiction of Mary as passive and obedient). I am so pleased that as we gather today to celebrate the great feast, that we have come to know Mary as the feisty, spirited, courageous, joyful woman who chose to go to the margins of her society; a woman of great capacity to nurture, love and care; a woman who showed fidelity, faith and generosity; a woman who educated, healed and advocated for her companions and community; a woman whose humanity allowed her divinity to be revealed; a woman who understood the signs of her times and responded prophetically. A woman who I can encourage young women to be like, and in who I see glimpses of the women who have and continue to fill my life with love and wisdom. It is indeed no surprise then that this day is the Patronal Feast of the Sisters of Charity as so many of the attributes of Mary that are revealed to us in scripture and interpreted through contemporary and inclusive perspectives of theology, are those that have allowed the Sisters of Charity to come to be among the most recognised and revered Religious Congregations in Australia. Like Mary who was impelled by the love of Christ (as mother and disciple), the Sisters of Charity have been impelled by this same source of creation to live with commitment to community, and vows of poverty, chastity, obedience and service to the poor. 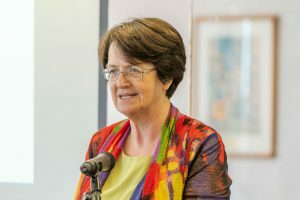 Over the 180 years of service to Australia, they have chosen to identify with those at the margins, they have stood courageously against Church and civil structures that limited their freedom to respond to the prophetic signs of their times; they have educated, healed and advocated; their witness to the gospel has inspired generations of lay Australian women and men to join them in the pursuit of justice. We are immensely proud of our deep roots that continue to seek nourishment in the foundations established upon the arrival of the Sisters in Sydney Cove in 1838. When the boatsmen rowed the first Sisters ashore and offered them that simple but profound benediction of “God Bless You Ladies”, they could not possibly have known what a “force of nature” they were to unloading! This simple gesture of transport was the beginning of long collaboration that has always been a characteristic of the Sisters and is of course today expressed through Mary Aikenhead Ministries. On this day set aside for the dedication of Mary we are delighted to be able to dedicate our beautiful new courtyard to you, the Sisters of Charity, who have found and continue to find such consolation and inspiration in Mary’s love for Christ. In doing so we link the past, present and future endeavours of those who will gather in this space with your great ministry in Australia. It will be a space of celebration, recreation and exploration and commemoration. It will be a place of story telling and your story will be one we will always tell with pride and joy. In the same way, the love of Christ has impelled you, it is my hope and prayer that the entire community of St Vincent’s College will have a daily act of consciousness when in the courtyard, and be reminded that CARITAS CHRISTI asks we be people of generous spirits, hopeful, respectful, just and committed to the service of the poor. Thank you for the honour of using this name and I acknowledge the role of the Trustees of Mary Aikenhead Ministries, represented here today by Sr Linda Ferrington and Mr David Alcock. They entered into careful discernment during the selection of the name and unanimously agreed that in this 180th year it was indeed fitting the motto of the Sisters should be enshrined here in the College – literally into stone and given great prominence. Later in today’s ceremony, Sr Clare Nolan will bless the courtyard and all who will enjoy its ambience. On behalf of the St Vincent’s Community we thank her for this great honour and also the blessing she bestows upon us through the companionship of Sr Anne Taylor (our College Companion), Sr Mary Francis Gould (Chapel Sacristan) and Sr Elizabeth Dodds (College Board member). Since 1858, when the first school opened on this very site, Sisters of Charity have served this community and we delight in having these three Sisters with us in active ministry. They stand upon the shoulders of those who have gone before them and they in turn will leave behind them what others will build upon. We have an unbroken link to the first sisters and we are deeply grateful for the connection they represent between the Sisters and the College. 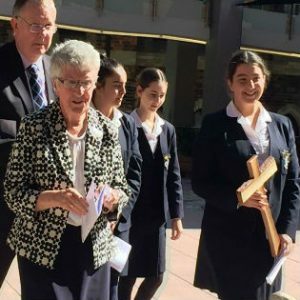 On behalf of the College, I would like to present to Sr Clare a cross made out of timber that grew in the very ground where the CARITAS CHRISTI courtyard now stands. The beautiful Camphor Laurel tree was greatly admired as a feature of the grounds and the timber was harvested for recycling as furniture and fittings for the College. The most beautiful of the timber was selected by our recently retired Grounds Manager, Mr Michael Bouchard to make this small gift to commemorate your 180th anniversary. Please accept this small cross as a sign of our enduring and evolving relationship. With joyful hearts, we ask that every Sister here presently stands so we can show our appreciation to you, as Sr Clare accepts this gift.